Python IDE compared. What’s an IDE and where to find them? An IDE is a program for software development. Its like the user interface for development: where you write code. What’s the best IDE? It depends on your preferences. You can choose an IDE based on feaures. An IDE is a software program. Its stands for Integrated Development Environment. Some IDEs are designed for one programming language, but others allow many languages to be used. PyCharm is one of the best Python IDEs. Its a graphical app that has powerful features like code navigation, code completion, syntax highlighting, code analysis, debugger and much more. 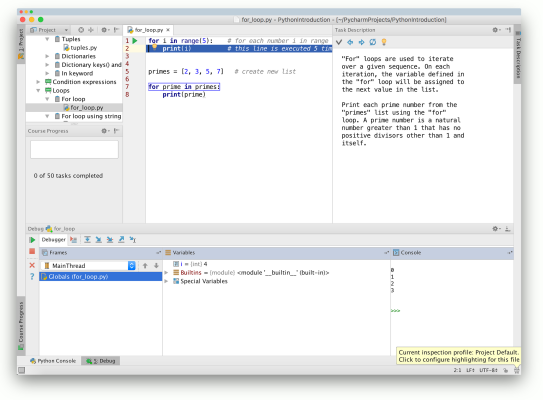 Spyder is a Python IDE from the open source community. Its often used by data scientists. Spyder works well with modules often used in data science like numpy, scipy and matplotlib. It supports a lot of the common feautures like syntax highlighting, code completion and file browsing. Wing IDE is a full featured IDE. It’s an IDE thats been around for almost two decades. It has many advanced features. Sublime Text is a popular IDE for developers. It has a very mininalistic look, but it’s a powerful editor. It has a package manager, addons, plugins, styles, tab windows, syntax highlighting and lots more features. In comparison to IDE its much more lightweight, but feature wise its much more than a simple text pad. Fully features IDE made in Python. Its based on Qt and cross platform (windows, mac, linux). Eric has professional features like source code folding, syntax highlighting, windowing, error highlighting and many more features. Vim is an advanced text editor. Its one of the oldest code editors around and it’s quite challenging to learn it. Many expert programmers use this editor as it’s powerful and works on any system, even remotely. Emacs is not only a code editor, it can do many more things like file browsing, web browsing and others. Like Vim it takes time to learn and master this editor. It has syntax highlighting, code completion, keyboard macros and many advanced features.